Background: Definitive chemoradiotherapy is standard of care in locally advanced cervical cancer (LACC). Both toxicity and local relapse remain major concerns in this treatment. We hypothesize that a magnetic resonance imaging (MRI) based redefining of the radiotherapeutic target volume will lead to a reduction of acute and late toxicity. In our center, chemoradiotherapy followed by hysterectomy was implemented successfully in the past. This enables us to assess the safety of reducing the target volume but also to explore the biological effects of chemoradiation on the resected hysterectomy specimen. Methods: The EXIT-trial is a phase II, single arm study aimed at LACC patients. 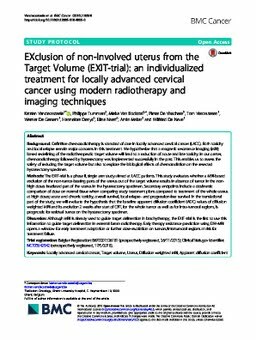 This study evaluates whether a MRI-based exclusion of the non-tumor-bearing parts of the uterus out of the target volume results in absence of tumor in the non-high doses irradiated part of the uterus in the hysterectomy specimen. Secondary endpoints include a dosimetric comparison of dose on normal tissue when comparing study treatment plans compared to treatment of the whole uterus at high doses; acute and chronic toxicity, overall survival, local relapse- and progression-free survival. In the translational part of the study, we will evaluate the hypothesis that the baseline apparent diffusion coefficient (ADC) values of diffusion weighted MRI and its evolution 2 weeks after start of CRT, for the whole tumor as well as for intra-tumoral regions, is prognostic for residual tumor on the hysterectomy specimen. Discussion: Although MRI is already used to guide target delineation in brachytherapy, the EXIT-trial is the first to use this information to guide target delineation in external beam radiotherapy. Early therapy resistance prediction using DW-MRI opens a window for early treatment adaptation or further dose-escalation on tumors/intratumoral regions at risk for treatment failure.